I love seeing this kind of nuts-and-bolts industrial design. 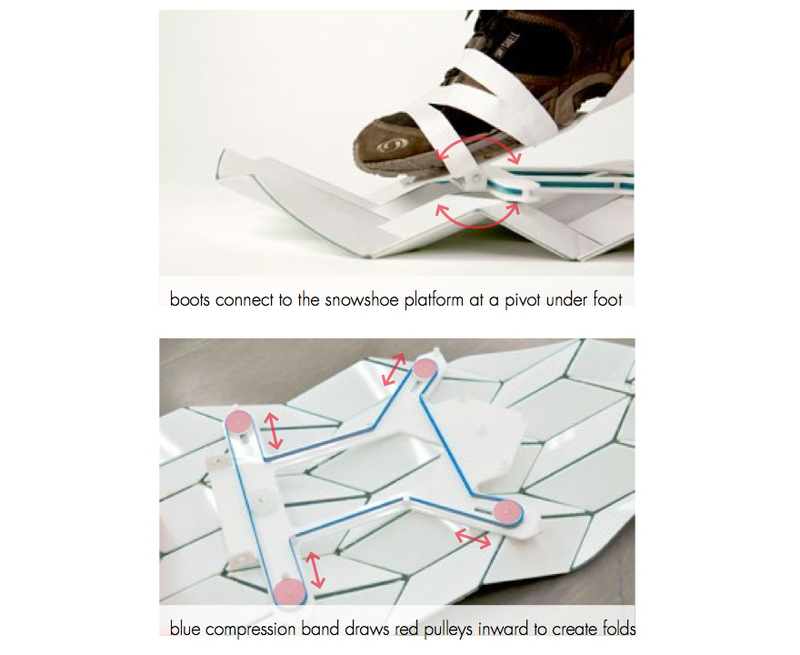 Seattle-based designer Eric Brunt observed that what makes snowshoes work is their increased surface area, which enables the wearer to "float" atop the surface. But that increased surface area also means that the wearer has to walk like s/he's in a Monty Python sketch. 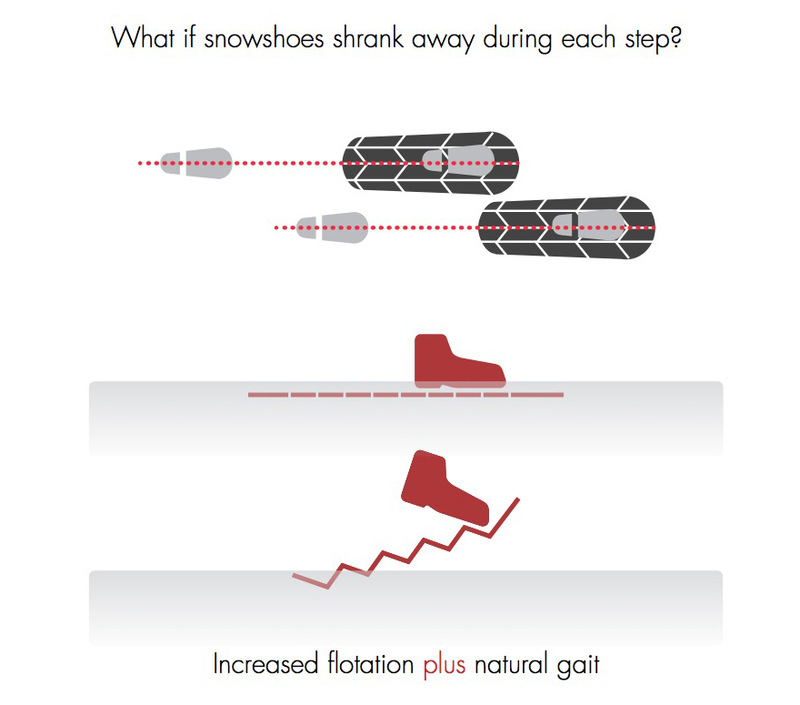 What if, Brunt reasoned, the footprint could shrink when lifted, enabling a more natural gait, then grow again when placed back onto the surface? ...and worked out a weight-triggered foot plate containing a compression band, so that when the user raises his foot, the band tightens and pulls the tiles in. As the user steps down, the tiles flatten out again. As I'm not a snowshoer—my primary experience with snow is falling down in it on slippery Manhattan streetcorners every January—I've got no idea if the design is actually practical, but I love that Brunt has laid out his development process for all to see. Nice work! Beautiful art. Nice documents and I appreciate the open spirit of the discussion. That said, I'm astounded that with all that work, there is not even a video of some level of use -- that would have been far easier than the animation. For all I know, there were many iterations with real-world testing, but evidence would be nice. I don't wear a hat often, but if these are usable for someone like me (snowboarder who need to climb), I'd buy a hat and eat it. So, while the spirt is nice, it looks like the design process needs thought. 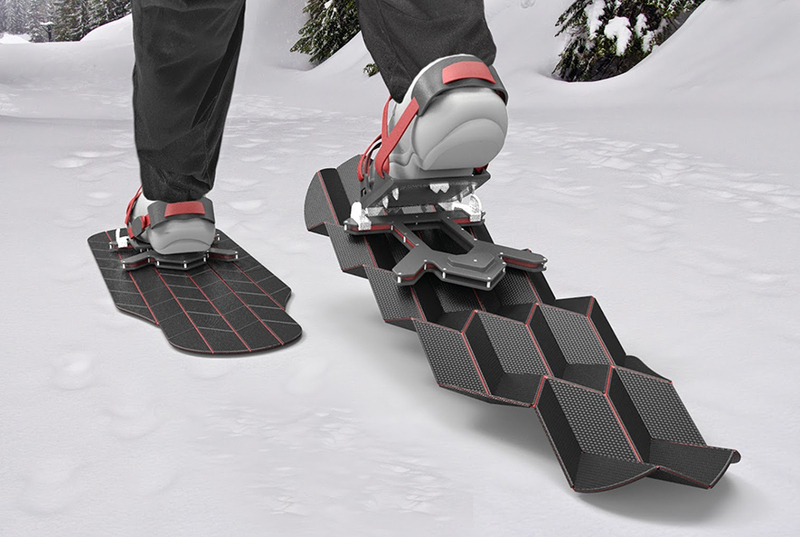 I definitely appreciate the attempt to make walking with snowshoes more natural; however, I'm afraid this design addresses what is really a minor inconvenience while sacrificing one of the most important features of a functional snowshoe: the built-in crampons. These might work alright on a completely flat surface, but as soon as you get on any type of slope you would be SOL. 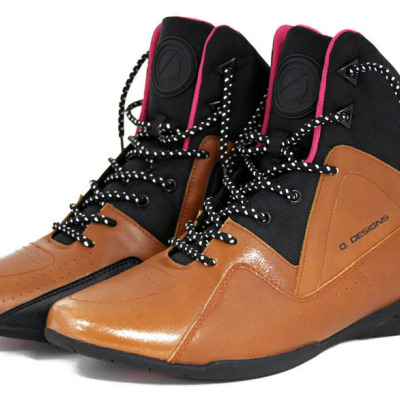 The lack of built-in crampons prevents these from being anything but a toy for even a recreational outdoorsman. I can't tell other than the one drawing. How much side compression is required so the stance is natural? it shrinks when any part of the unit shrinks, because of the mechanical linkages, the pulling tension transmit throughout the unit. since he had 4 points of shrinkage, helps spreads out the tension instead of a single point of failure. its really well designed. as for the concern where snow gets into the bends, entire bottom can be one solid surface like covered with a fabric so there's no space for dirt to accumulate in the hinges. but from a mechanical strength standpoint, the many moving parts does weaken the structure overall significantly and stepping on uneven surfaces would quickly damage the mechanism. 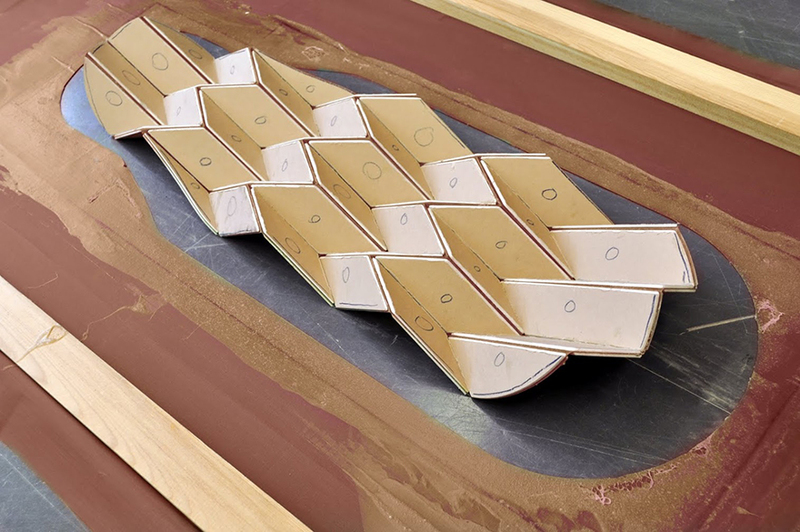 a better design would be passively bending material, like how the bottom of our feet conforms to the surface rather than bending like a door hinge. 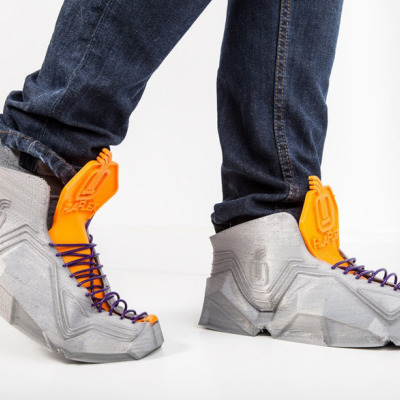 Would the inherent flexibility of the shoe reduce the effectiveness of the areas furthest from the foot? I love the idea, and the novelty of the geometry. 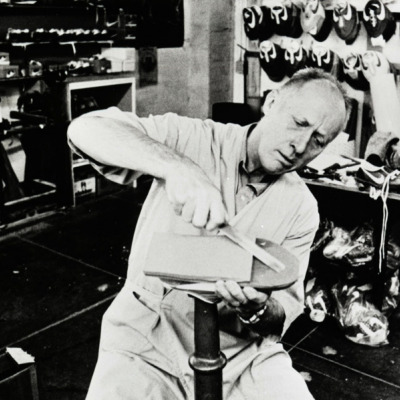 Perhaps the foot plate could be made longer extending full length of the shoe. 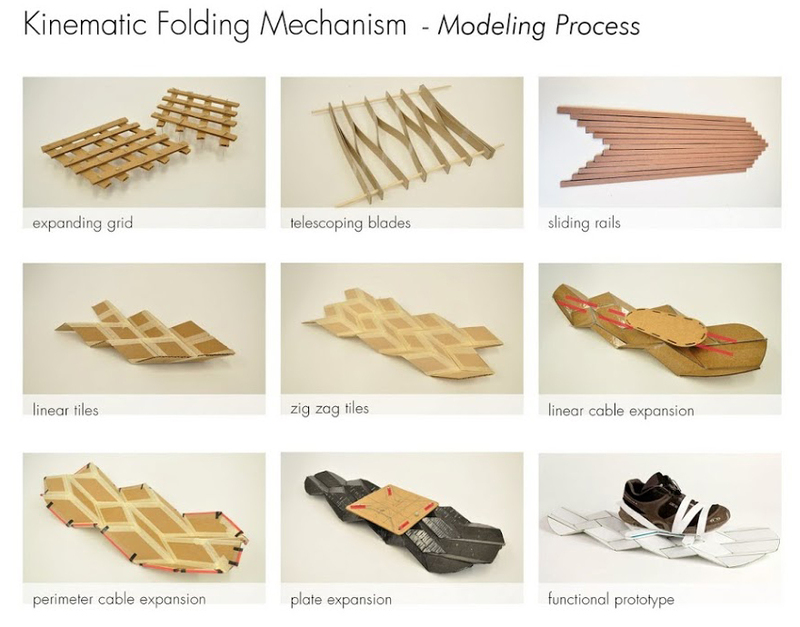 Really good investigation into "kinematic folding mechanisms", and and a good problem identification. But what happens when there is snow in all the cracks and in the mechanics? And the compression band freezes? 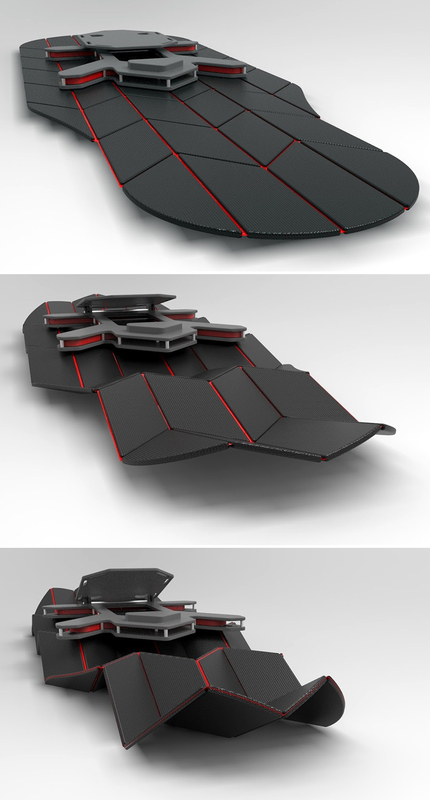 Believe these would be quite slippery if the bottom surface is flat. I have used snowshoes for hiking and mountain climbing. Walking with snowshoes is not a major problem but how to achieve max carrying capacity for a user to walk rather on the top of the snow layer than shoes pushing all the way to the ground. 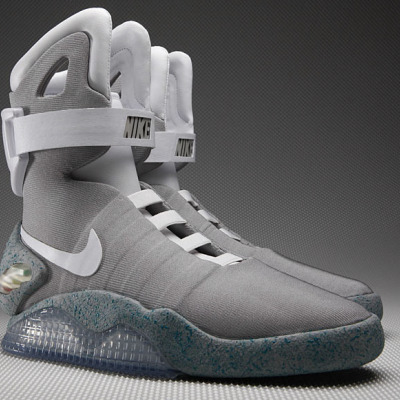 Nike to Release Marty McFly's Back to the Future 2 MAGs--With Power Lace Feature!